My favorite chocolate treat growing up was Baci chocolates. Mmm little kisses with a special message about love written on a paper slip wrapped around the chocolate. The delicious combination of hazelnuts and chocolate brings back memories of special occasions like Christmas, Easter or when a relative or friend from Italy came to visit and brought a box as a present. You could not buy Baci in Australia in the early 1970s, so you needed someone to bring them over to you. Chocolate was always a treat, a celebration. My chocolate, hazelnut and fig tart has a Baci inspired base then a thin layer of chocolate and hazelnut spread. To cut through the richness, I add a layer of good quality fig jam. The fruit cuts through the richness of the chocolate and matches the hazelnuts perfectly. I will take a slice to my mother’s when I visit her for lunch today. She will no doubt ask me what I was celebrating… Ma cosa ti celebri?. I will tell her that we are celebrating my upcoming trip to Italy in July. 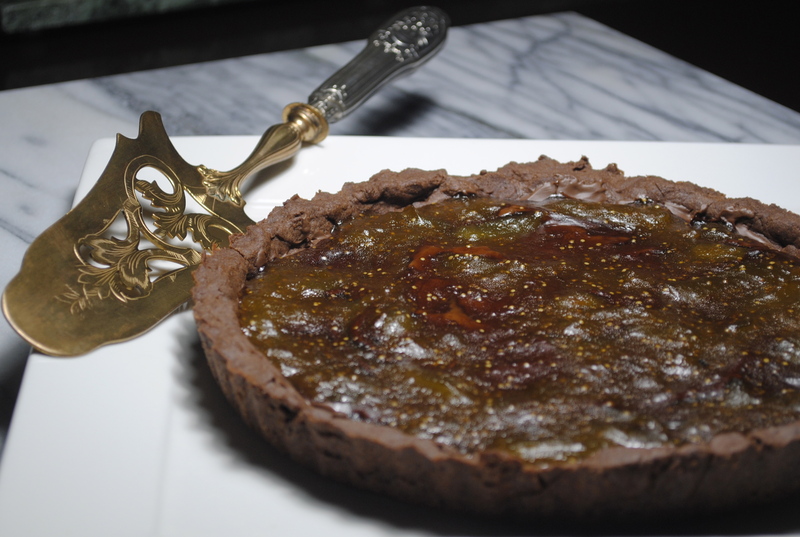 Enjoy this deliciously wicked Italian tart with a strong coffee. Preheat the oven to 180 degrees (fan forced, 200 degrees in a regular oven). Line a 23cm diameter tart tin with a removable base with aluminium foil. Place the butter and icing sugar in a mixer (I have a Kitchenaid with a paddle attachment) and beat until it is creamy. Combine the flour, cocoa, salt and hazelnut meal in a separate bowl. Add to the butter/sugar mixture and beat for less than a minute until the mixture resembles crumbs. Add the egg and beat for around half a minute or less until the mixture forms a ball. Remove the pastry from the mixer and flatten into a disc. Cover with plastic wrap and chill in the fridge for 20 minutes. Using a rolling pin, roll the pastry between sheets of plastic wrap until it is the right size to fit in the base and cover the sides of the tart tin (to about 1 cm high). Place the pastry into the lined tin, making sure you push the pastry to mould the tart tin on the sides to about 1 cm in height. Put a piece of baking paper on the pastry and weigh the paper down with pie weights (I use rice). Place the tart in the oven and bake for 10 minutes. Remove the weights and baking paper and bake for another 5 minutes. The base is now cooked. Allow it to cool down on a wire rack until it is close to room temperature. Spread the chocolate and hazelnut spread onto the base (you can probably eat a spoonful from the jar whilst you are doing this…I did). The base should be at a temperature that does not allow the chocolate spread to melt too much. Next, evenly spoon the fig jam over the chocolate. If your jam is a bit thick, place it in the microwave for around 20 seconds so that it is runny. Make sure you use a pure fig jam (some have ginger or other ingredients added that may not necessarily go with the chocolate). I used St. Dalfour Royal Fig (from France). Place the tart in the oven and cook for 12 minutes. Allow the tart to cool on a wire rack before removing from the tin. Enjoy this wonderfully rich Italian tart at your next celebration! Thanks Amira. I am glad you enjoyed the post. After a few bad experiences of cakes/tarts sticking to the tin, I line everything always! I made this tart on the weekend for my mum’s birthday – she loved it! The pastry was particularly good, I’ll definitely be using the recipe again! That is great to hear Fiona. I love a success story! !